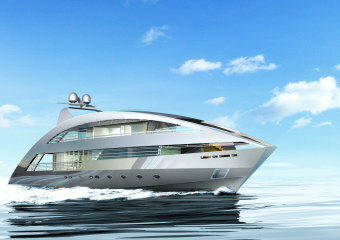 The first yacht in the new fleet of 135-foot luxury vessels is slated for delivery this December. 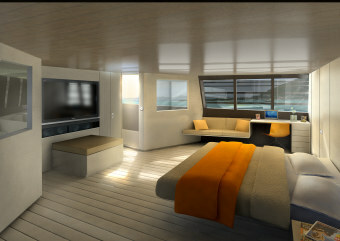 Three of the Signature Series yachts are slated for delivery next year, with three more expected in 2010 and again in 2011. These striking Signature Series crafts offer 5,737-square-feet of usable living space, with five suites that can sleep up to twelve guests, in addition to chambers for the seven-person crew. Foster's design focuses largely on the quality of light and views, and offers thirty percent more indoor and outdoor space than other yachts in its class. A team of seven architects from Foster + Partners spent fifteen months perfecting the design. The high-tech Rodriquez Cantieri Navali yard in Sarzana, Italy, was commissioned to build the yachts. an owner's cabin with his and her private balconies. YachtPlus' Luxury Management program offers owners a one-eighth stake in a super-yacht and a guaranteed thirty-four days of use each year, including eleven days in the Mediterranean, eleven in the Caribbean, and two cultural tours in either locale lasting six days each. Lifestyle Management can arrange for transportation, hotel accommodations and excursions for owners, ranging from golfing to vineyard visits. Fractional owners pay an initial fee of 1,850,000 Euros, or about $2,479,646, and an estimated 200,000 Euros, or $268,069, annually to cover maintenance costs and other fees. Owners have access to any of the ten vessels planned for delivery over the next three years. Owners can opt out of the program at any time, and YachtPlus will re-market the ownership with proceeds, minus associated costs, going to the owner. Each yacht will be sold by the company after eight years to ensure that the fleet is kept up-to-date, and owners will receive full, pro-rated proceeds from the sale of the yacht at open market rate. If an owner is not able to use the yacht during the time they have scheduled, the company allows the vessel to be chartered, cutting losses for the owner. The ownership does not allow the yachts to be used as security, which protects owners from creditors in the event of another owner defaulting on a payment or the company declaring bankruptcy. When signing up for the YachtPlus program, owners each place a down payment and are required to sign up for the program within a month. Once each of a yachts' eight co-owners do so, construction of the yacht begins. The yacht is delivered approximately eighteen months later. YachtPlus, founded in London in 2005, has commissioned ten Signature Series yachts, and has left the door open to add other vessels, of which owners of any yacht in the fleet would have use.